A spiralizer is a great kitchen appliance that is perfect for creating unique recipes. Spiralized vegetables bring a trendy, yet delicious source of veggies to your diet—everyone from restaurant chefs to home cooks are spiralizing these days. 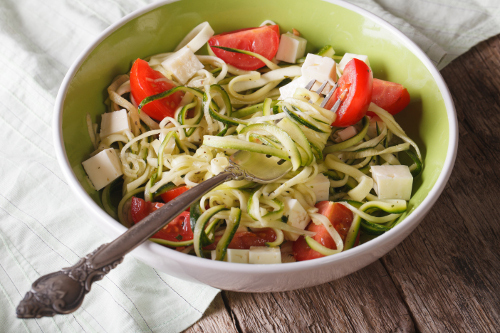 Spiralized vegetables will help you cut back on carbohydrates and still enjoy eating food. Basically, spiralizing vegetables is a great way to consume nutrient-dense vegetables, especially when it is a challenge eating veggies at every meal. Spiralized meals are also a great way to cut gluten from the diet as well. Think of a spiralizer like a shredder or mandolin; however, it does so much more. The nifty spiralizer is a favorite among nutritionists, as it “spirals” vegetables into noodle-like shapes. A spiralizer is also relatively inexpensive, and will cost $15 to $50 on most websites. As an alternative, you can use a vegetable peeler to make flat, wide noodles instead. The spiralizer will transform a variety of vegetables into thin spiral shapes. It is best to use symmetrical foods, with some of the more popular ones being cucumber, sweet potato, large carrots, and zucchini. It is best to use veggies that are small to medium-sized. You won’t be able to use very large vegetables. You can also spiralize some fruit like small apples. Step 1: Wash and peel your veggies before spiralizing. Some veggies like the zucchini do not require peeling, just washing. Step 2: Center your veggies. It often takes a little practice before this is done right. Step 3: It is a good idea to dry your spiralized vegetables that contain some water, and may get soggy, such as the zucchini or cucumber. Root veggies like carrots, on the other hand, will be crunchy. They often store nicely. Once you get a hang of it, using your spiralizer is quite easy. Let’s take a look at five unique recipes made with the spiralizer tool. A “zoodle” is a unique name a spiralized zucchini noodle. The zucchini is the easiest vegetable to turn into noodles, and it pairs well with radishes and cucumbers. Adding zucchini to the diet is also an efficient way to get more vitamin C and manganese into the diet. The following salad recipe is a great appetizer that can feed up to six people. Add the chopped and spiralized vegetables to a large mixing bowl and save a few of the chopped veggies as toppings. For the dressing, place all the dressing ingredients in a food processor and blend until it is well combined. Pour the dressing over the vegetables, and mix until well-combined. Top with the leftover chopped vegetables. Marinated tofu will add protein to your spiraled zucchini. Fermented soy is a good protein source to consume on occasion. The following recipe can be a hearty meal for two people that will have you feeling full afterwards. For the marinated tofu, slice the tofu into about 64 half-inch cubes, and place them in a large container with a lid. Add the oil, tamari, garlic, vinegar, lemon zest, basil, maple syrup, salt, thyme, oregano, and pepper. Secure the lid, and toss until the tofu is thoroughly coated in the marinade. Add the tomatoes to the marinade. Marinate in the fridge for 30 minutes to an hour, or even overnight. Spiralize the zucchini, and divide into two large bowls. Top the zucchini with a generous portion of marinated tofu and tomatoes, and a few spoons of marinade. Add the avocado, basil, sun-dried tomatoes, red pepper flakes, sesame seeds, and pine nuts. You don’t have to eat your spiraled veggies raw, you know. You can bake your spiralized zucchini and sweet potato tossed in a wide variety of herbs and olive oil. Once this tasty base is finished, you can any additional toppings you want, including tomatoes, green onion, and artichoke hearts, and a soft-boiled egg. This is perfect for lunch or dinner. It is pretty delicious, and you likely won’t have any leftovers. Preheat the oven for 400 F. Spiralize the sweet potato and zucchini, and toss in extra virgin olive oil, salt, pepper, and other spices and herbs. Bake the veggies in the oven for 20 to 25 minutes. Serve in bowls, and top with grape tomatoes, green onion, artichoke hearts, and a soft-boiled egg. You didn’t think every recipe using the spiralizer would contain zucchini, did you? Curly fries are the perfect way to transition from hearty zucchini-heavy meals to a tasty appetizer. The following curly fries recipe calls for white potatoes—although they sometimes get a bad rap, they can actually be quite healthy. White potatoes are loaded with nutrients like fiber and vitamin C. This recipe will make four servings as a side dish. Spiralize the potatoes, and then cut the spirals into smaller, bite-sized fries. In a large bowl, mix the fries with olive oil, and herbs. Spread the fries over two parchment-lined baking sheets. You will use two baking sheets to avoid overcrowding the potatoes. Sprinkle with sea salt, and bake the trays in the oven for about 15 minutes. Swap the trays, so the one on the top goes to the middle, and vice versa. Bake for another eight to 10 minutes, and remove from the oven. Serve hot. Spiralized beets make for an amazingly unique and delicious salad. Beets are nutrient-dense, and contain lots of folate, manganese, potassium, and fiber. They also combine well with roasted grapes and goat feta in the following recipe. The recipe will also feed up to four people. Preheat the oven to 350 F. On a baking sheet lined with parchment paper, toss grapes, olive oil, and tarragon together, and season with salt. Bake for about 15 minutes, and set aside to cool. Bring a pot of salted water to a boil. Blanch the beet noodles for two to three minutes, and drain and rinse with cold water. In a small bowl, whisk together 1/3 cup of olive oil, salt, pepper, and champagne vinegar. Toss the beet noodles in the dressing, and add the crumbled goat cheese and roasted grapes. Garnish with fresh tarragon. Add Some Spiral to Your Diet! For those looking for an easy way to get more vegetables into the diet, the spiralizer machine is definitely the tool to consider purchasing. Whether it is zucchini, sweet potato, or cucumber, the spiralizer can be used to create delicious meals and side dishes. Most spiralizer brands are plastic machines. It is important not to get the plastic pegs that hold the veggies in place too close to the metal spiralizing blade. If it gets too close, you may chip the plastic with small pieces ending up in your food. There are also larger stainless steel spiral attachments that you can get for mixers that cost around $100. Liddon, A., Oh She Glows Every Day: Quick and Simply Satisfying Plant-Based Recipes (Toronto: Penguin Canada Books Inc., 2016), 103, 135. “Roasted, Easy, Herby Spiralized Vegetables +13 More Spiralized Recipes,” Fit Foodie Finds, May 23, 2014; http://fitfoodiefinds.com/2014/05/roasted-easy-herby-spiralized-vegetables-20-spiralized-recipes/, last accessed March 20, 2017. 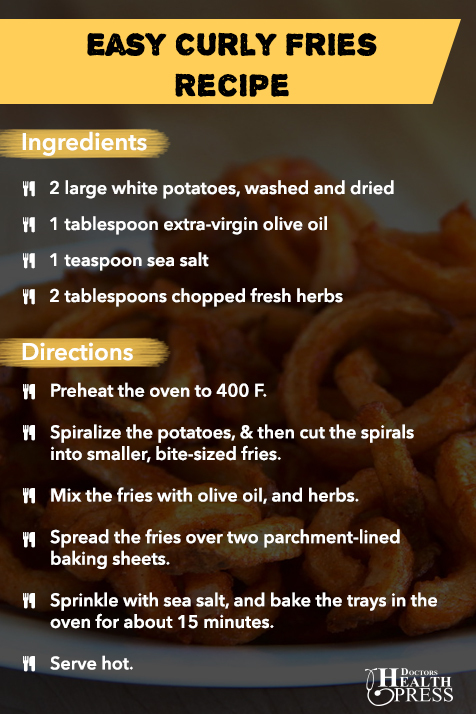 “Crispy Baked Curly Fries,” The Healthy Maven, Aug. 31, 2014; http://www.thehealthymaven.com/2014/08/crispy-baked-curly-fries.html, last accessed March 20, 2017. “The 5 Best Spiralizer Recipes,” The New Potato, May 12, 2015; http://www.thenewpotato.com/2015/05/12/best-spiralizer-recipes/, last accessed March 20, 2017. Campbell, G., “5 Tips for Using Your Spiralizer,” Kitchn, June 2, 2016; http://www.thekitchn.com/5-tips-for-using-your-spiralizer-231442, last accessed March 20, 2017. “Zoodle Salad Recipe,” Dr. Axe; https://draxe.com/recipe/zoodle-salad/, last accessed March 20, 2017. “Avocado Ranch Dressing Recipe,” Dr. Axe; https://draxe.com/recipe/avocado-ranch-dressing/, last accessed March 20, 2017.